NO_GAPS —A feature will be created for the areas in the output that are completely enclosed by polygons. This feature will have blank attributes. You can then select the features with blank attributes below a threshold size and calculate their attributes to be the same as the original polygon - or copy/paste them in the Editor's Attribute window. Features with blank attributes above the threshold size should be deleted. From there the Dissolve tool should complete the job. PolyGeo's solution is one I have employed myself and works well (+1). Another alternative is to buffer your polygons by a small amount and then de-buffer the result by the same amount (say +1m and then -1m). This also works well but carries a small risk of accidentally joining polygons that neighbour by the same amount as your buffer. It can also increase your vertex count (which may or may not be a problem). You could also write a script for a robust solution by iterating over each polygon, creating temporary polygons based on the interior rings and testing these for their areas. If they are below your threshold, you then remove that interior ring from the geometry and update your row. This solution is more work than PolyGeo's solution or my buffer hack above but is possibly a "purer" approach. You can use "Eliminate Polygon Part" tool (Data Management Tools -> Generalization) in ArcToolbox. 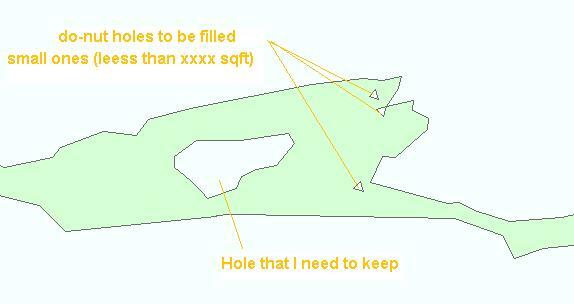 You can specify minimum hole area/percentage to remove. Here's another way to remove lakes from polygons (like the zip code map layer from Navteq). This is also useful to clean up territory map layers that have been generated by dissolving the zip code map layer by the territory code. Use a Geoprocessing "Union" on the polygon map layer and remove the checkbox for “Gaps Allowed” (which is checked by default.) This creates polygons for all of the "donut" holes in the polygons. In the resulting Union map layer, add fields for ID, X, and Y. The ID should be separate from the name/ID of the polygons that have the donut holes that you want to remove. In the attribute table, use the Field Calculator to calculate the ID from the ObjectID field and use "Calculate Geometry" to fill in the X and Y values. Separate the donut polygons from the other polygons by selecting (Select by Attributes) those where the name field is null. Do a spatial join between the new point layer and the ORIGINAL polygon map layer that does not have the donut polygons. Use the “closest” option so that the name of the surrounding polygon gets appended to the attribute table of the donut polygons. Use the Field Calculator in the attribute table to calculate the null polygon names from the joined point layer. Run a Geoprocessing "Dissolve" based on the polygon name to merge the donut polygons with the larger named polygon. Note that this will not correct the problem of the rivers that are cut into the outline of the polygon, but it does improve the original map layer by removing the inner donut holes. This will yield a South Africa which has Lesotho's area filled in, essential for workflows such as outputting vertices for use in Polygon visuals in Tableau. Set the minimum_hole_size to the minimum size of a polygon hole you want to keep. Smaller ones will be eliminated. PS. The optional minimum_area value in the same tool does the same for the polygon parts that are not holes. Not the answer you're looking for? Browse other questions tagged arcgis-desktop arcgis-10.0 area filling donut-polygons or ask your own question. Removing small “salt & pepper” polygons from layer in QGIS? How to quantify the coverage area? Counting number of polygons line intersects using ArcGIS Desktop? Dealing with negative buffers in ArcGIS Desktop when original polygon is narrower than buffer width? Combining polylines which share endpoints using ArcGIS Desktop?